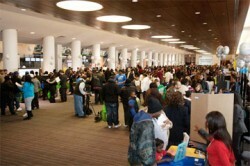 Chicago parents searching for schools that serve all neighborhood children will be able explore and exercise their options on Saturday, Jan. 28 at the Fifth Annual New Schools EXPO. The event, co-hosted by the Chicago Public Schools and New Schools for Chicago, responds to parents’ dissatisfaction that more than 100,000 public school students currently attend low performing schools. Most are on the South and West Sides. Representatives from more than 100 of the newest and best schools, including charter schools, will be available to answer questions. To avoid missing application deadlines, parents can submit the simple forms on-site. Parking and admission are free; pre-registration is recommended. For more information, visit http://www.newschoolsNOW.org or call 312-462-9036. © 4020 Chicago Hispanic Newspaper, Lawndale News, Hispanic Bilingual Newspapers, Su Noticiero Bilingue. All rights reserved. XHTML / CSS Valid.